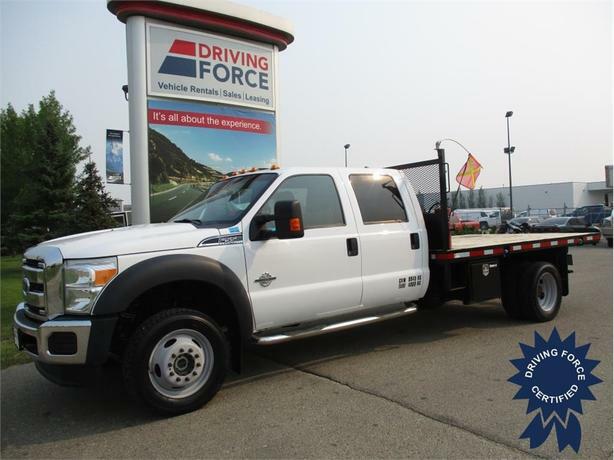 This 2016 Ford F-550 Super Duty comes with a 200-inch wheelbase, 84-inch cab-to-axle, 6-speed automatic transmission with SelectShift, limited slip with 4.88 axle ratio, 19.5-inch argent painted steel wheels, electronic-shift-on-the-fly, trailer brake controller, transfer case skid plates, Low Deflection Package, spare tire and wheel, 6-ton hydraulic jack, 6-way power driver seat adjuster, exterior backup alarm, manual transfer case, block heater, part-time four-wheel drive, 175-amp alternator, towing with harness, 10346# Maximum Payload, HD shock absorbers, front and rear anti roll bars, hydraulic power-assist steering, 151.4-litre fuel tank, and 6.7-litre Power Stroke Diesel V8 engine delivering 300 horsepower and 660 lb-ft of torque. The GVWR rating is 19,500 lbs (8,845 kgs). Email us to obtain more information on this heavy-duty commercial truck at DRIVING FORCE.